Small Draughts/Checkers Set + PVC board. Small Draughts/Checkers Set + PVC board.. Type: EQUIPMENT. Detail: GARDEN. Product Code: GDCSB. 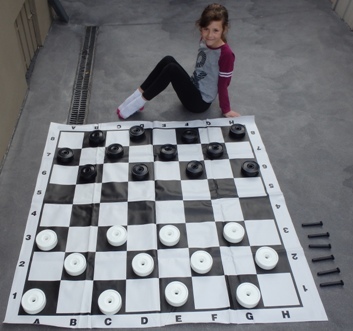 This family friendly draughts/checker set can be played indoors or outside. The height is 4.5cm and the base is 10 cm. It comes with a PVC board measuring length = 132cm and width 132cm. Small plastic poles allow pieces to be connected to form a king.